Everyone loves an author. So write a book already! Mother Theresa is an unlikely place to start when talking about fame and celebrity. Lady Gaga, Bill Clinton and Angelina Jolie — all seemingly better choices when trying to deconstruct that upper echelon (top 1%) that live in the spotlight. And more importantly: why them, and not you? In Fame 101 – Powerful Personal Branding & Publicity for Amazing Success, authors Jay Jessup (Alpha Celebrities) and Maggie Jessup (former investigative journalist) attempt to unlock the mystery of fame, and provide a formula (literally) that you can use to build your own personal brand regardless of profession – lawyer, doctor, social media guru, journalist. And, yes, even nun. What, they ask, differentiated Mother Theresa from thousands of other nuns out there working amidst the world’s most wretched? The argument goes that it was no fluke; that through personal branding — publicity, focus, message, marketing, etc. — she was able to elevate herself to the superelite (I’d suggest that wicked karate chop as the real reason). This is not the kind of book we normally review on Stark Insider. I admit I hold strong skepticism when it comes to these reach-for-the -stars prescriptions. Still, I downloaded the review copy because I wanted to try to understand: (1) why in society today, there is a seeming arms race for social media “love” (a fame of sorts, I reckon); (2) if there really is a formula that can help us build these so-called personal brands; and (3) how I could possibly apply any of the concepts to myself and Stark Insider — were these even “brands” at all, and were they in motion, requiring honing and tuning? 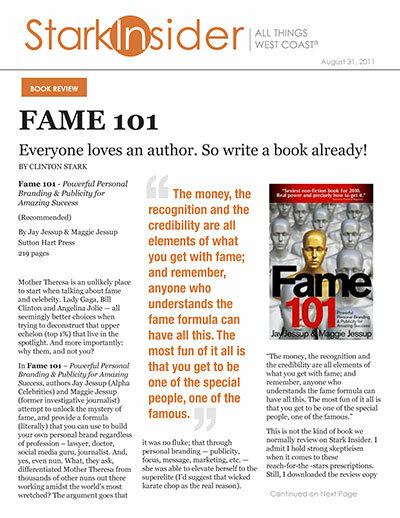 Fame 101 is a quick read. Zipping through the 219-page PDF on an iPad, I was done in a few hours. Ayn Rand this is not (a good thing considering the topic). I found the opening chapters interesting as the authors explored the concepts of celebrity (Paris Hilton) and fame (Barrack Obama), with a brief visit to the early days of Hollywood where the phrase “movie star” was coined. The Kennedy’s were the first to take fame multi-generational. This new American Royalty then spread across other fields: music (Glen Miller in the 1940s), finance (Malcom Forbes); and later to sports (Tiger Woods), religion (Joel Olsteed), politics (Bill Clinton) and even medicine (Dr. Sanjay Gupta on CNN). After analyzing all of these scenarios, the authors discovered common characteristics, and repeatable processes. Using the fame formula a priest became a pope, an unknown local television weather girl became Oprah, a caterer working out of her house became Brand Martha, and a homeless writer became best selling author J.D. Rowling. The problem is the authors do a much better job describing examples of fame and personal branding than they do actually illustrating techniques for implementing their formula (a 5-phrase tongue-twister). Time again, they fall into the trap of providing examples of fame (Billy Graham) after the fact, instead of diving deep into specific behaviors or concrete techniques. I would argue that there is huge dollop of “art” — the unknown, the lucky, the intangible. But focusing on that too much would be a lost cause as selling the dream would be infinitely tougher. Still, to the authors’ credit, they reinforce the notion of hard work. There are no short cuts, and fortunately they are not false prophets. If you follow their plan, though, you could see results within 12 months. A strong suit of Fame 101 is its explanation of building credibility in an effort to reach the paid speaking circuit. For many, there could be some helpful ideas here. Unless you’re just in search of vanity, you’ll want to monetize your brand, your fame. Everyone loves an author. So write a book already! “A successful book, with your name on the cover, is terrific for your personal brand and a serious fame-builder” The “personal celebrity website” should follow. Despite my initial skepticism I came away somewhat impressed with the content. Thankfully there is no get-rich tone, and the authors do much to assert their expertise. And although there is a lot of name-dropping (how can you not, when you’re talking Fame 101?! ), this is not necessarily about red carpet celebrity. Applying some of these principles, for example, could make you a better community leader, or a more effective public speaker. Social Media Gurus: I’m still not quite sure what to think about these hugely liked, largely followed characters. Talent alone won’t necessarily separate you from the pack. I suspect that by following some of the Jessups’ advice — especially the sections about presence, media exposure and blunders, and fame barriers (“self created, get past them”) — you’ll surely come out ahead on your quest for a personal brand. Where you take it is personal of course… well, unless, you’re some kind of fame monster.